The HOBO UX120 Thermocouple Logger is a four-channel LCD data logger for measuring and recording temperature in a broad range of monitoring applications. 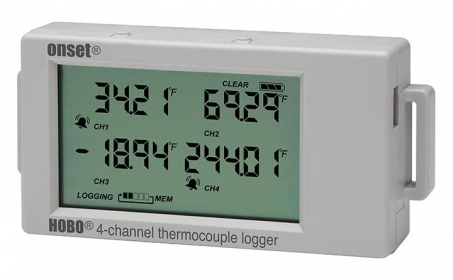 The logger makes it easy and convenient to record temperatures over a broad range (-260 to 1820? C) and can accept up to four J, K, T, E, R, S, B, or N type probes. In addition to accepting four thermocouple probes, the logger features an internal temperature sensor for logging ambient temperatures, further extending the range of application possibilities. Requires HoboWare software for configuration and data download. For this and other accessories, please refer to the recommended products area below. IMPORTANT: Hoboware software is now available as a free download that will suffice for most applications. The PRO Version is available for extra analysis tools and use with a Data Shuttle. For the differences between the FREE and PRO versions, please refer to the BHW-Lite (Hoboware Free DVD & USB Cable) entry in the Recommended Products section (below). The download link is also available on the BHW-LITE Page. Miniplug connector to attach Thermocouples to Data Loggers, such as the UX100-014M single input & UX120-014M 4-Thermocouple input Data Logger. For Type K Thermocouples. Type K beaded Thermocouple Probe with 1.8m of insulated wire and a Sub-miniature connector. Type T beaded Thermocouple Probe with 1.8m of insulated wire and a Sub-miniature connector.